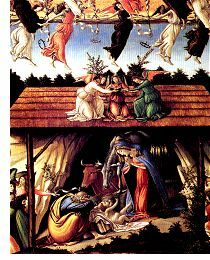 "A painting of Christ's Nativity is often a comfortable Christmas card. Boticelli's picture is the reverse. It is the record of a spiritual struggle, a pilgrim's progress in which the pain is remembered. "The Nativity is not one of those pictures which can be enjoyed through the eye alone. It is, in the best sense, a literary picture, to be read and slowly unriddled in the light of all that we can know about the painter and his times..."
Thus this wonderful painting offers an unusually rewarding way to pass a few hours with one's family and loved ones, or even by oneself, during this Christmas season.